So Part 6, is the final B Block specific article! B Block is officially decided, so keep your eyes open for Mathew’s A Block article after the April 29th show. 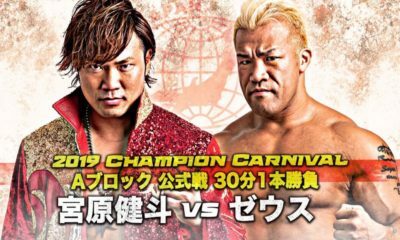 Who’s going to win the Champion Carnival this year? 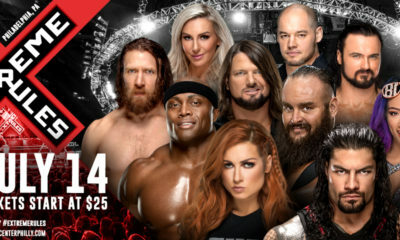 Before we start with the article, it needs to be mentioned that, Kyohei Wada (referee), Jun Akiyama (holding Motoko Baba’s picture), Masanobu Fuchi (holding Bruno Sammartino’s picture) and Takao Omori open this show with a tribute to Mrs. Baba and Bruno as the rest of the roster surrounds the ring. Since the music is muted, I’m assuming it was just subtle and solemn music as they stood there for probably about 5 minutes, then did the 10 bell salute. This whole night is filled with emotion, and oddly, we have very poignant moments bookend the show. This is definitely a show to watch for everyone. Yoshitatsu just had a big upset win over Suwama. So even though he’s mathematically eliminated, ending strong is important too. Whereas, Yoshie has really shown a lot of growth in this carnival. With only one win, he’s had a long struggle, and shown frustration, but he’s a damn solid worker for his size. 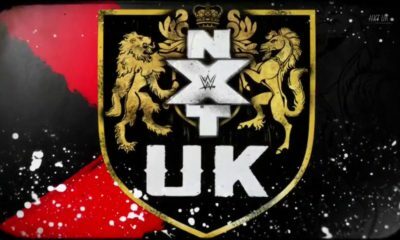 This match had good pacing and showcased both guys well. At one point while locked in the Koji Clutch, you heard the crowd rally behind Yoshie. We all love the under dog, but it’s been a more consistent theme of the crowd getting behind him as the Carnival continued. After breaking out of the Koji Clutch, Yoshie hits a few power moves and a Warrior style running splash, but Yoshitatsu kicks out. Normally whenever Yoshie goes to the top rope or acts like he’s gonna do a dive, his opponents literally run away or get up to interfere. 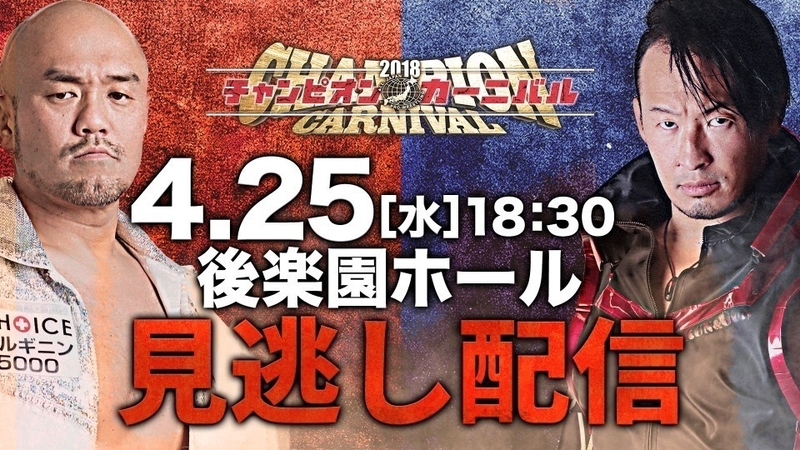 FINALLY, we saw Yoshie hit a Top Rope Body Splash, flattening Yoshitatsu, and ending the tournament with a win. 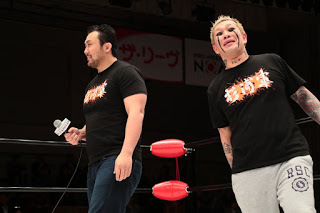 I may have said this before but Zeus has some of the best music in All Japan, as well as his new look with the long tights, just makes him look more impressive. Not sure if it’s to hide the taped up thigh injury, but it’s a look he needs to keep moving forward. So the match begins with KAI trying to play spoiler, but Zeus controlled a good portion of the early goings. Zeus goes for his signature Chokeslam a few times, but KAI fights back just when you think the match was over. Countering two Chokeslams, hitting some nice offense himself, finally the fans start believing KAI has a chance. Zeus finally lands the Chokeslam, but KAI kicks out. So Zeus doesn’t waste much time trying to finish it with the Jackhammer, but KAI reverses it into the Gonnosuke Clutch, for a big upset. 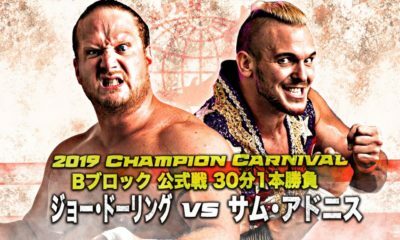 Now, Zeus is eliminated from winning the B Block, since Akiyama and Marufuji both have 8 points, and win, lose or draw…Zeus fell short because he needed a win. Falling in an upset in his last match, we see Suwama still with the best chance to win the block. Suwama owns a win over Akiyama and Marufuji, so if he wins, he’s in the Finals. Standing between him and the Finals, is one half of the tag team champions, the big gaijin, Dylan James. James came out of the gates quickly, trying to impose his power over Suwama. But Suwama, much like Hiroshi Tanahashi of New Japan, has been an Ace of All Japan, and you can’t punk out the Ace. 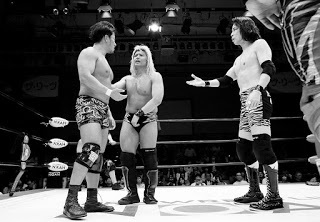 However, it feels like Suwama fell into the trap of wrestling James’ power style match. 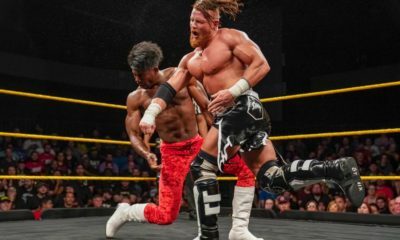 He didn’t lean on his experience or veteran cunning, and tried to just trade lariats and big moves. If it’s anything we’ve seen in this Carnival, it’s when you play Dylan’s power game, he usually gets the best of that. Some nice resiliency from Suwama throughout this match. From kicking out at one after a big western lariat, and absorbing a lot of big moves, all before eventually falling to a Chokeslam. And with that, Suwama, who had the best tiebreakers, is now eliminated from winning. WOW! This is history everyone. 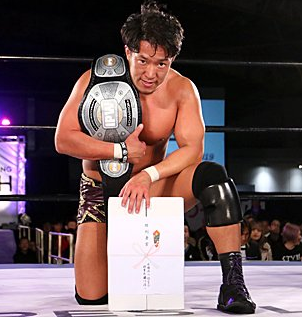 Marufuji beat Akiyama for his first GHC Championship over in NOAH, which also made him the first person to gather all the GHC titles. Akiyama was a protege of Mistuhara Misawa, as well as one of the bigger names that left NOAH after Misawa’s death. 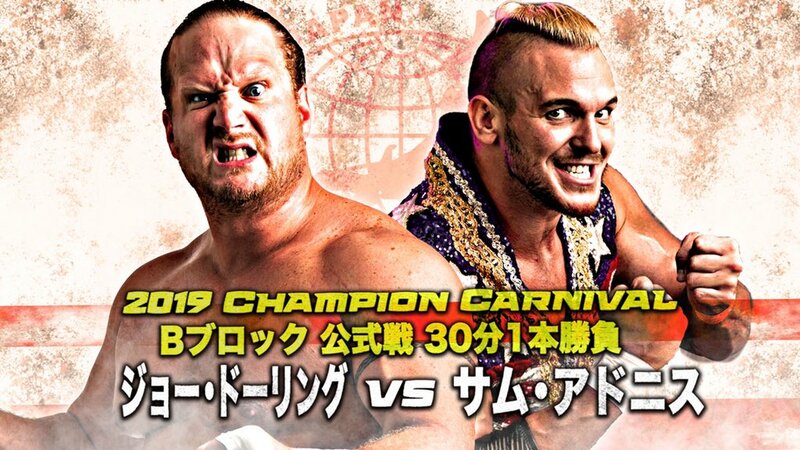 So this not only decides who wins B Block, it’s All Japan vs NOAh, a battle for Misawa. Akiyama pulls a couple quick tricks early to establish his veteran cunning, but one of the more poignant moments early is Marufuji delivering chops to Akiyama against the ropes. Marufuji grit his teeth and had this look in his eye of betrayal and anger, and Akiyama’s body language was very accepting, almost like he felt he deserved it. We then get a quick exchange of Akiyama no selling Kawada kicks, getting fired up and flinging out Marufuji. Naomichi however takes a page out of Akiyama’s book, and as soon as Jun goes chasing, Marufuji slides back in, to catch him with a big drop kick on the way back into the ring. One of Akiyama’s nicknames is Sterness, judging from the fact his expression rarely changes, but it’s always stern looking. Akiyama manages to get the advantage next time they go to the outside, catching Marufuji with a knee after an attempted plancha. A big apron draping knee drop and spiking DDT, gives Akiyama a little breathing room while Marufuji stands on his head (literally). We get nice exchanges, including Akiyama countering one Shiranui and when Marufuji finally lands one, it’s too close to the ropes so Akiyama grabs the bottom rope. Marufuji then goes for a Fisherman Flowsion which is an homage to Misawa’s Emerald Flowsion, but Akiyama counters it and begins to get a second wind. It’s at this point the stubbornness and urgency picks up. Akiyama trying a flurry of knees and exploder suplexes, just for Marufuji to kick out. Then we have Maurfuji go into his own flurry of knee strikes and kicks, just for Akiyama to kick out. So in a very telling moment, Marufuji goes to the corner, pulls down the leg of his pants to expose a tapped up and battered knee, just to hit Akiyama with one last Ko-Oh. Finally, a pinfall happens, and the crowd, who was electric the entire time, roared in support of Marufuji. It’s worth noting that whatever bad blood may have still lingered, seemed to leave with Marufuji and Akiyama sharing an understanding knuckle touch, before the battered warrior was helped to the back. 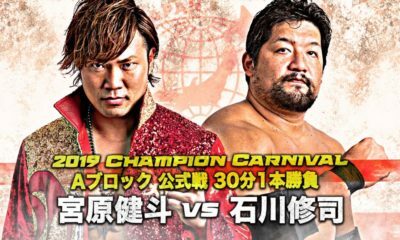 Marufuji moves on to the Finals, after what could’ve been Akiyama’s last Carnival match, and there’s no more fitting way in my opinion.